It's certainly helpful to know how to put yourself together quickly when you're crunched for time—for example, when you overslept and your morning meeting starts in 25 minutes. But on the other hand, do you really have to devote an hour to your hair even on those mornings when you have to time to spare? Instead, consider rotating any of these gorgeous hairstyles—all of which take about half a minute to put together—into your daily routine, and hit the snooze button without any of the usual guilt. Click through to unlock a much more manageable (and prettier!) morning routine. The half-bun remains beloved not just because it's cool or quick—it also works for all kinds of hair textures and lengths. Case in point: these lovely curls. Throw it back and let the loose waves fall where they may. Even short-haired gals can get in on this action—in fact, a half-up 'do looks extra cool on your cropped strands. Our only tip is to use an elastic with extra grip, as shorter locks are more likely to slip free. Thought headbands were reserved for long locks? This ultra-pretty look should convince you otherwise. Channel this 'do with ASOS' delicate pearl headband (£8). 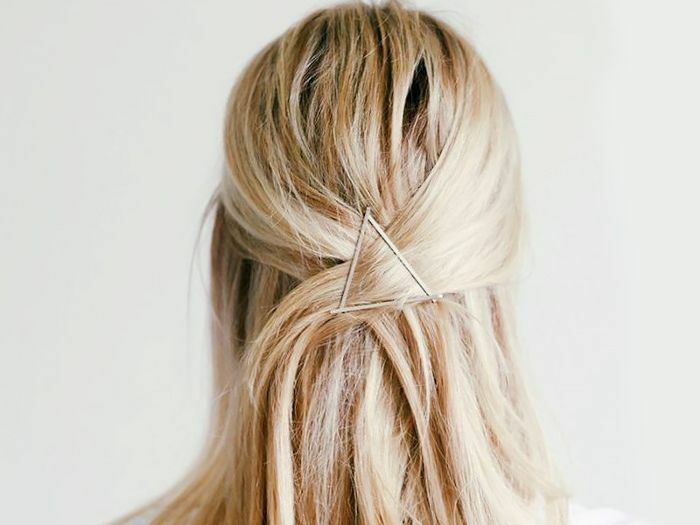 We (and uh, the rest of Pinterest) love this triangular look, but it's just one of countless ways to get inventive with bobby pins. After seeing countless iterations of this effortless style on the runways every fashion month, we actually went ahead and timed it ourselves (because professional stylists have a tendency to make everything look easy). The verdict? About eight seconds to catwalk cool. This ponytail style never fails to impress, because people don't realize it's deceptively easy. Once you've tied your pony back into an elastic, just wrap a small section of hair around it and secure with a bobby pin. Or, skip your own hair and add a little edge with a Leather Ponytail Wrap (£9) like this one instead. No matter your length, try pinning just one side back with a pretty barrette. For those mornings when a shower is non-negotiable but you don't have time to blow-dry, work a little bit of Oribe's Grandiose Hair Plumping Mousse (£36) through your roots and comb your hair back with your fingers.